Herbs have been around for a long time, and have adapted well to the most adverse conditions. Drought continues to be a challenge for gardeners everywhere, and herbs are a great choice for any garden where water may be an issue. We have over 30 different varieties of herbs will grow well in times of drought. An easy to grow succulent widely used medicinal herb known for its healing properties. A bushy, woody-based perennial grown for its aromatic silvery foliage. A wonderfully unusual flower and edible! Extremely attractive to butterflies and other pollinators. Laurus Nobilis is commonly known as Bay Laurel or Sweet Bay, this savory culinary herb is a must for any chef! This perennial variety makes a wonderful ground cover, a soothing tea and a great skin treatment for sunburns! An easy to grow native wildflower with gorgeous color! Coreopsis will brighten your garden with its beautiful blending of burgundy and yellow colors! It is very easy to grow! A beautiful, long lasting perennial, this cone flower is a work horse in the garden and looks beautiful in cut bouquets! Bronze Fennel adds striking beauty to your garden, provides a safe haven for butterflies and makes a wonderful culinary and medicinal herb! Green Fennel is flavorful culinary herb, potent medicinal herb and a great host plant for Swallowtail butterflies! A potent medicinal herb for treating respiratory infections, Horehound's fuzzy leaves are beautiful in the garden. NEW! Calycinum, St John's Wort, is an easy to grow groundcover. St John's wort is most widely known as an herbal treatment for depression. NEW! This Lantana 'Athens Rose' is heat tolerant and provides color from spring to early frost..
A bold and bright yellow cluster of flowers that bloom continuously from Spring to Fall! orange blooming above lovely crinkled green foliage. NEW! This lavender is great for Xeriscaping! This variety is deer and drought resistant! This hardy lavender is best appreciated for its tall, sturdy growth habit and large, profuse blooms. 'Hidcote' has beautiful dark blue blooms that smell great and have great healing potential! One of the best varieties of Lavender for its medicinal value, this aromatic bloomer has a smaller, shrubbier habit. The ideal Lavender for crafts and potpourri, this variety is also deer and drought resistant! Lemon Balm has a terrific lemon aroma that tastes great in teas and salads, and it's even a natural mosquito repellent! 'Sweet Marjoram' is an elegant and versatile culinary herb with a milder flavor than its cousin, Oregano. NEW! This sturdy climbing vine is a stunning old favorite! Herbalists recommend Mullein as one of the safest and most useful herbal lung tonics. This zesty herb is the most flavorful Oregano and a staple for pizza sauce! Italian Oregano is an excellent culinary variety with a strong spicy flavor. 'Arp' has been introduced as an improved variety which shows better winter hardiness. Upright and robust, this aromatic herb has a pleasing flavor and fragrance for cooking and soaps. A low-spreading, evergreen shrub or ground cover. The leaves are VERY aromatic! 'Salem' Rosemary smells and tastes terrific and its stems make great shish kabob skewers. 'Tuscan Blue' Rosemary is a beautifully fragrant herb that produces wonderful dark blue flowers. Wonderful native, selected as the 1999 Perennial Plant of the Year. Rudbeckia 'Prairie Sun' has daisy-like blooms from midsummer till frost. A wonderful sage, all around plant for every use! Purple Sage is the most medically valuable Sage and tastes great in stews and on meats! White Sage is a wonderful natural insect repellant, cleanser and is most commonly burned to repel negative energy. It makes a great medicinal tea! Also known as Bee Sage, or a Smudge Stick plant. NEW! A refreshing lemon scent greets you when you brush against these leaves. Woad has long been used for its production of Indigotin dye and may prove useful in fighting breast cancer. Drought is a common issue for many areas, especially throughout the summer months. For those who live in exceptionally dry areas, it can be even worse all through the year. As such, if you enjoy the taste of fresh herbs, it would be very beneficial to grow your own drought tolerant herb plants. There are a number of different options, and below are a few common ones you probably already enjoy. Bay is a unique herb plant in that it is actually a tree, however it may be potted and pruned to live as a house plant or an accent plant on a deck. Either way, it is important that you give this herb a good amount of space so that it can receive adequate air circulation. Bay leaves are a great ingredient to add to any soup or stew. Thyme is a very versatile herb that can be used different ways. There are a few different types of thyme that are used for cooking, such as English and lemon thyme. There are also other types of thyme, including lemon carpet thyme that is used more so for decoration; these herbs can be seen peaking from under walking stones and release the delicate scent of thyme when stepped on. Both uses of the herb offer a very enjoyable experience. Lavender is a beautiful herb known for its variety. Provence lavender particularly is known for being drought and deer resistant. These colorful blossoms offer an enjoyable experience all around, from sight, to smell and to taste. Oregano is a common staple amongst herb plants. There easy maintenance and culinary uses make it a favorite amongst individuals looking to grow and harvest their own herbs. These plants can reach up to thirty inches tall, however it is best to harvest them before they bloom and to keep them at a height of eight to twelve inches by constantly harvesting them. Rosemary is a resilient herb as well as a favorite cooking herb for many individuals. This herb may be placed in different areas of a garden, or it may be potted for growth indoors, adding to its lasting abilities. Rosemary grows best in somewhat dry soil, however it is imperative that the soil is not completely dry. Fennel is another staple herb for a cook’s arsenal. Not only are these plants drought resistant, but they are also known to attract butterflies, another beautiful element to add to your budding garden. These herbs grow up to six feet tall, so you will want to keep them in the back of your garden. You will also want to harvest their seeds before they fall to prevent over-saturation in the following season. Sage is easy to grow from a seed, but can be cut from an outdoor plant to pot indoors. This beautiful herb comes in a variety of colors, making it a great addition to any garden or house. Either way, you will want to make sure that it receives plenty of sunlight, as it thrives best with great sun exposure. 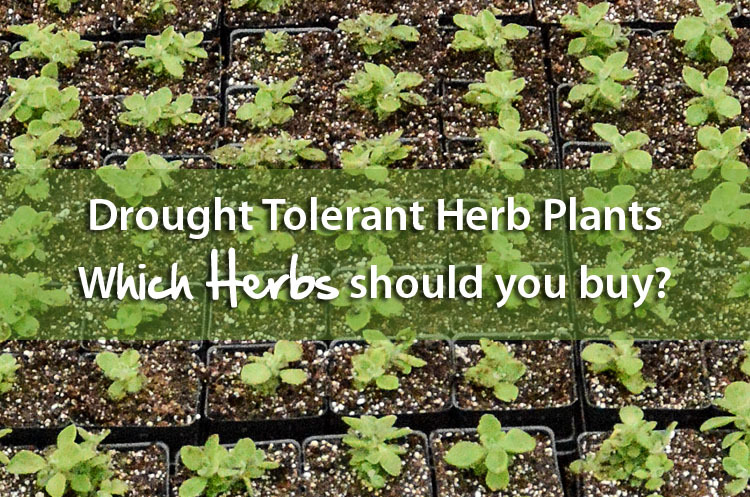 Whether you live in an area, like California, that is commonly plagued with drought or you experience high levels of heat a few months each year, having a stock of drought tolerant plants can prove to be very beneficial. Not only can it add to your cooking enjoyment, but these plants can also enhance the vibrant colors and scents of your home and garden. Consider the aforementioned herb plant options and be sure to do your own research, through a local expert, or by contacting us.